Hi Helmar Fans! Christine joining you today to share a home decord piece that I created. I love to create home decor pieces to use throughout the house and I especially love to use my crafting supplies to do that! This week I have an owl canvas that I made for my daughter to share. I have not delved into the mixed media part of crafting...so this one is created simply using basic paper crafting techniques! I cut out othe owl and letters on die cutting machine and then attached those to the canvas using Helmar's Decoupage and Craft Paste. I added it to the canvas in the areas I was going to put the paper down and then added another layer on top of the die cuts. Very simple and very quick! 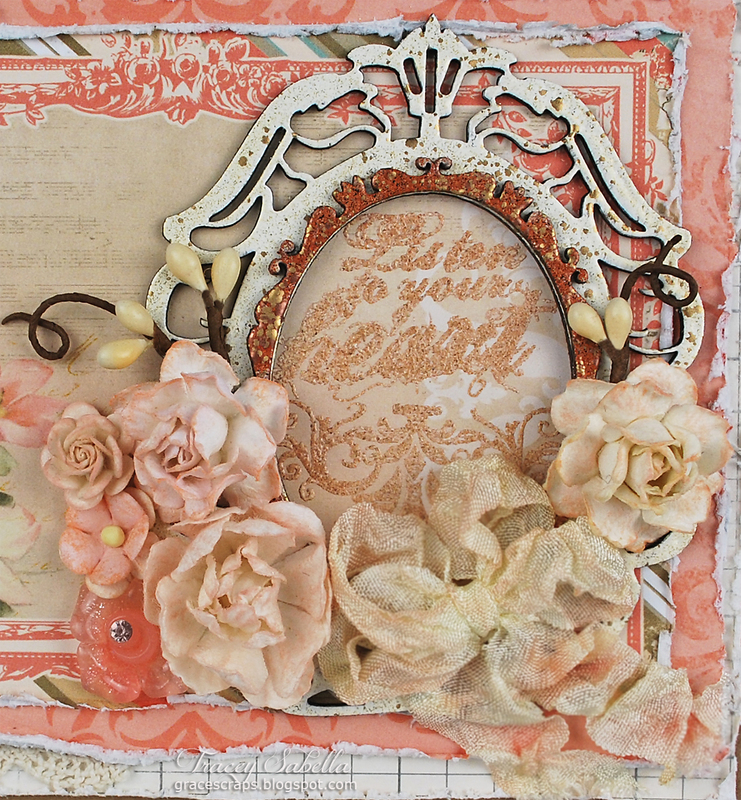 To finish it off I simply added some washi tapes along the border, some flower stickers, and some gems. Other than dry time it was a quick little project! Ava here to share a morning beauty lakeside with all of those who have the opportunity to view this presentation daily and for those who must wait till the sunshine of summer brings this lily to our lake side waters. I miss this morning presentation at this time of year and wanted to enjoy a layout that would bring back the warm sunshine to my face with the gentle lake side breezes. A few supplies you will need for this layout. 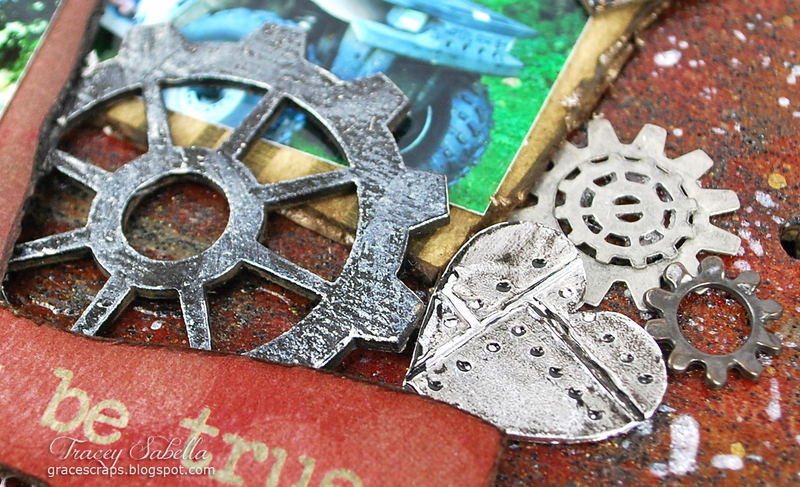 Helmar's Scrap Dots and Quickfix Adhesive Runner.Floral punches and Alpha dies. 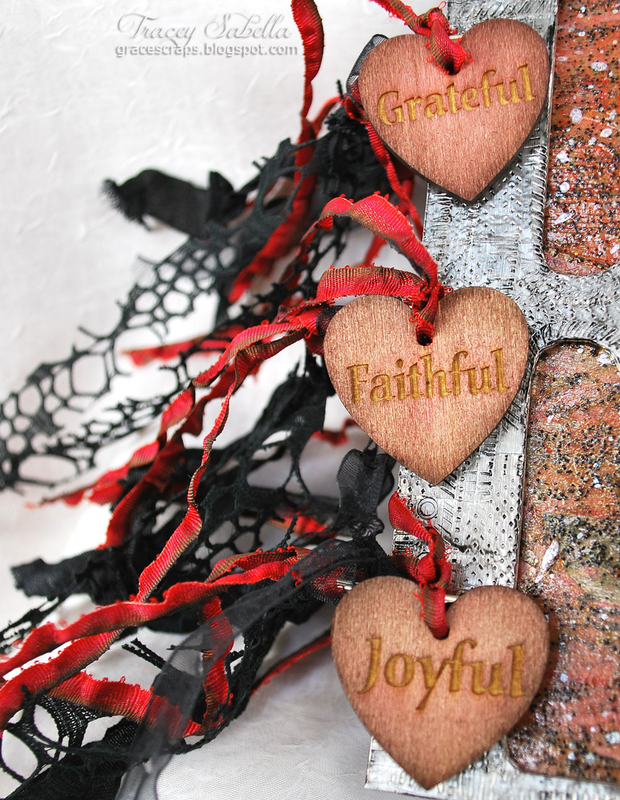 Helmar Scrap Dots are great to give a project a 3D dimensional effect. Remember to lightly assemble the layers of petals and let the glue dry well before moving around. The Helmar Quickfix Adhesive Runner is a great adhesive to assemble layers of cardstock. Ya just gott'a love the black Helmar ZapDots to give a project a 3D dimensional look. Add some bling and ink and you are taken back to the early morning lake side beauties that we all admire. Helmar Adhesive sure does give the 3D effect to this layout, just as the lily floats on the lake in the early morning. Helmar is a recognized leader of adhesives and aerosols in the Arts and Crafts industry and we are looking for new design team members to promote our amazing products. If you’d like to be a part of one of the most creative and easy going design teams out there, while showcasing Helmar products and your talent, this call is for you!!! We are looking for dedicated creative design team members who work well with deadlines and guidelines. Designer positions on the Helmar Design Team are for a 6 month term beginning March 21st, 2014. 3) The possibility of a selection of products from our generous Preferred Partners throughout your term. 1) 1-2 projects per month consisting of posts on the Helmar blog, your personal blog and sharing on Facebook. 2) Keeping your personal blog and Facebook page up to date and linking and promoting Helmar products at every opportunity. 1) Name, address, daytime/evening phone number and email address. 3) Links to your online galleries, blogs, Facebook and Twitter pages. 4) A List other design teams you are now on or have previously been on. 5) A brief paragraph letting us know why you would like to be a part of the Helmar Design Team. 6) Two examples that will best showcase your work. Please ensure file sizes are not overly large or small, nothing over 1mb. 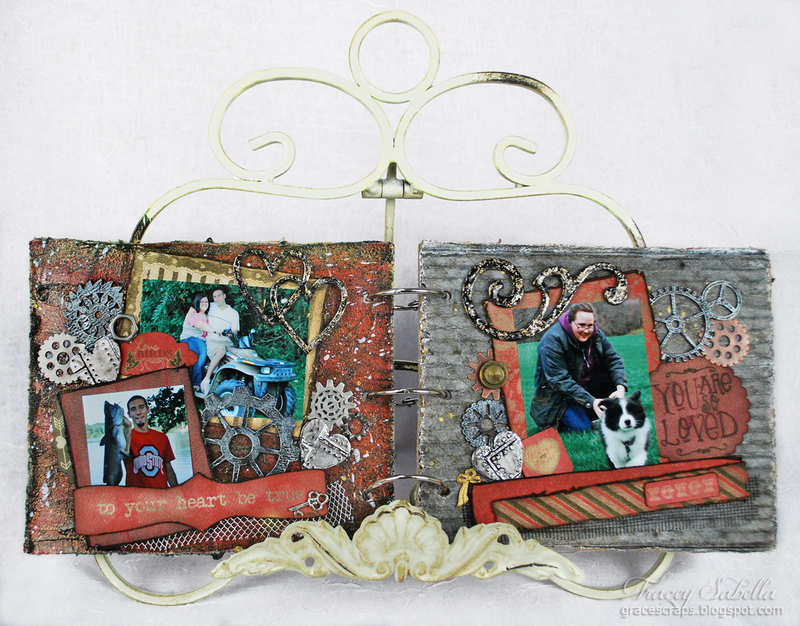 Examples could be your Papercrafts, altered art, mixed media, craft projects, kid’s projects, home décor, etc.) Make sure to list any special techniques you’ve used using adhesives. Please submit your application to khitchen@helmar.com.au by Friday 21st March 2014. ** At this time we are only accepting applications from Australia, Canada and United States. Today I thought I'd put together some simple but lovely gift tags that I can use in the future when I may not have the time to make them. Using Helmar's wonderful Premium Craft, Gemstone and Craft and Hobby PVA glues they were a breeze to put together. To start with find the paper of your choice, I used Prima's 'Devine' paper and cut a tag 3.5" high x 3" wide, fold in half to form a tag that is 1.5" wide, trim top corners off evenly. 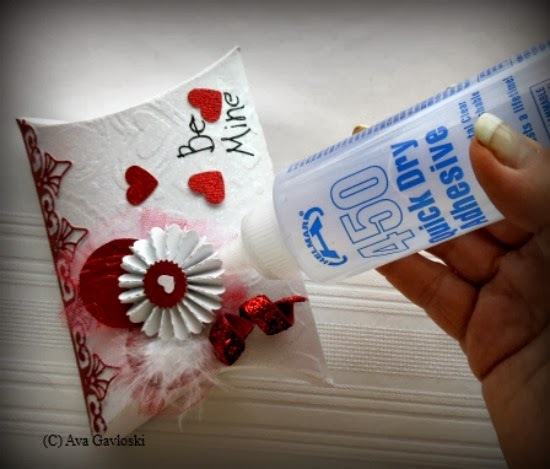 Using the Craft and Hobby PVA glue, glue the folded tag together neatly, flatten and allow to dry. 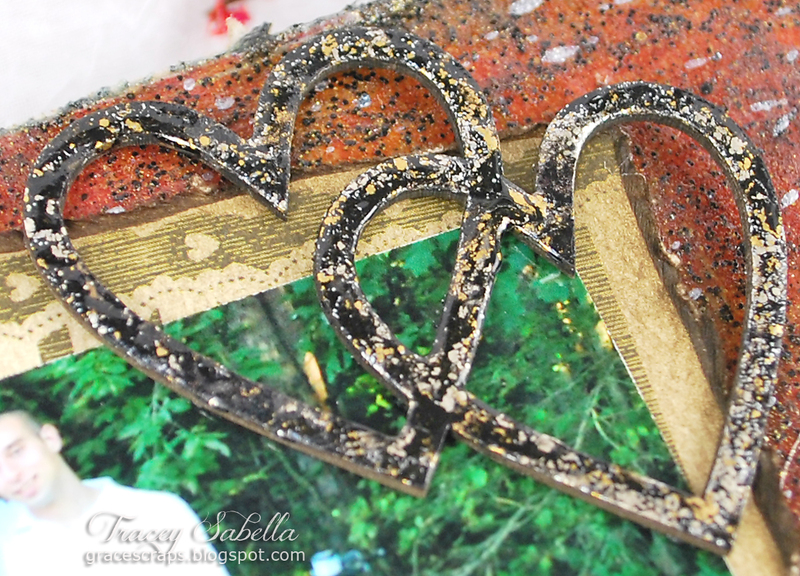 Once dry, go around the edges of the tag with glitter, I used Antique Gold, allow to dry. Once this has dried, you can now add your lace using Helmar Premium Craft Glue, trim around the edges where necessary and then apply a little of the Helmar Gemstone Glue in various places around the lace to attach the irredescent beads. This glue is ideal for clear and irredescent products because it won't cause any clouding. Once this has dried, attach a folded ribbon to the top using Helmars Premium Craft Glue and finish off with a small embellishment, I used a little flower from some beaded trim. I've left the backs rather plain so that there is a place to write on. Hi Helmar Fans! Christine joining you today! Do you ever find yourself trying to figure out how to apply liquid glue for small items and not have it seep out all over the place. Today I am going to share how I do it! I used the Craft Glue to apply the bakers twine on this that makes it look like Super Boy is holding up the sign. What I always use is either a pin or a toothpick to apply small amounts. I simply dip it into the glue and then go from there. As you can see here it makes it easier to make a little line of glue. I also used some foam round zap dots to pop up my banner. Thanks for stopping by today! Make sure to come back and see some more great projects! 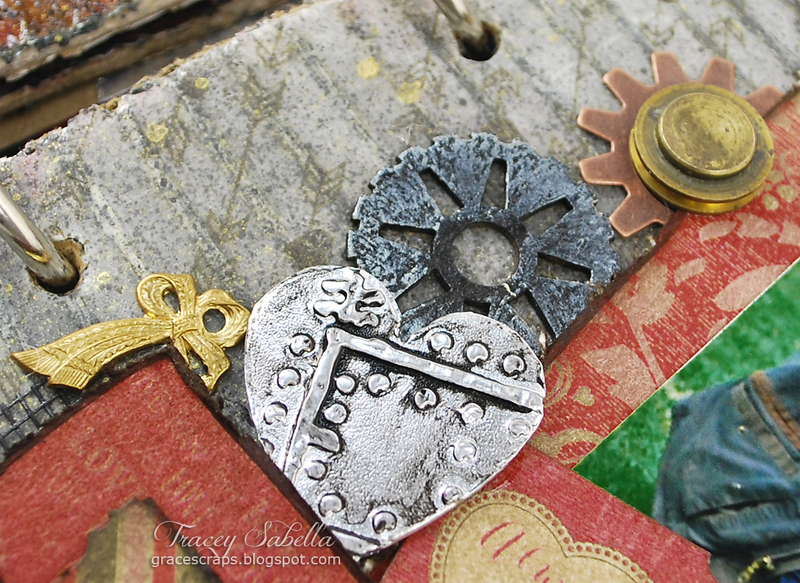 It's Tracey here to share a special Valentine's project. 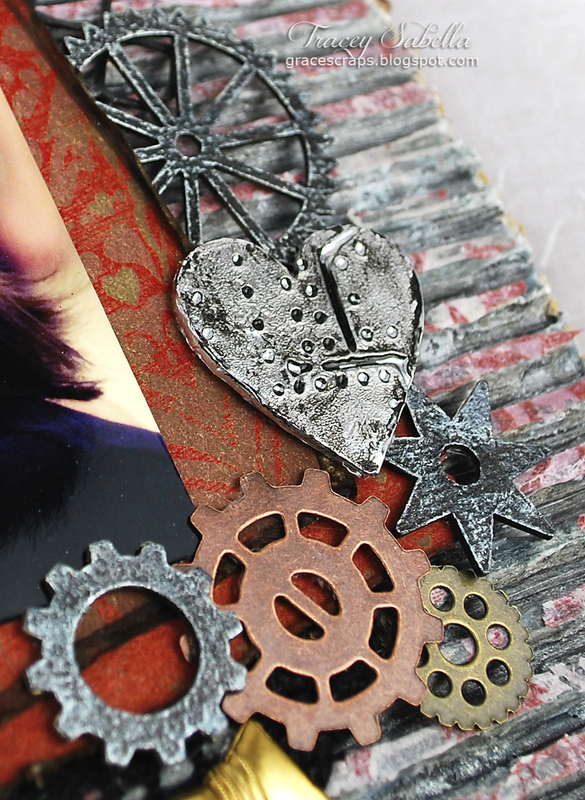 I created this grungy LOVE Family Mini Album as a gift for my husband starting out with a page of us together then one page each for our four children. The backgrounds behind the "Love" cover and throughout my album have several layers of mixed media. I found that the mist I had applied over other mediums stayed quite tacky, even after allowing to dry for a day. 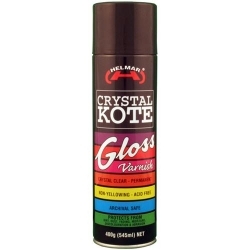 Helmar Crystal Kote Gloss spray was the perfect solution. It set the mixed media with a lovely glossy finish that allowed the grungy textures and colors underneath to shine through. I know I say this all the time, but it bears repeating. 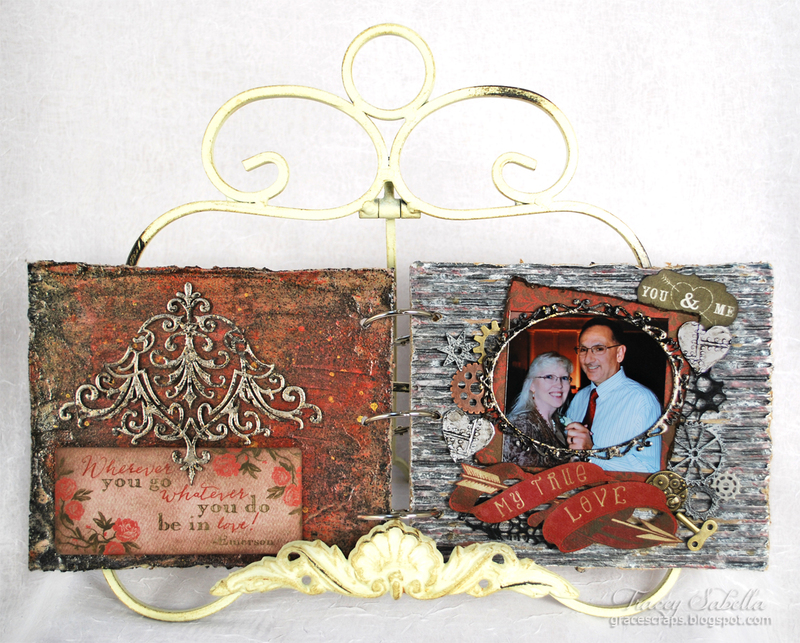 I find that most adhesives don't adhere well to a mixed media background. 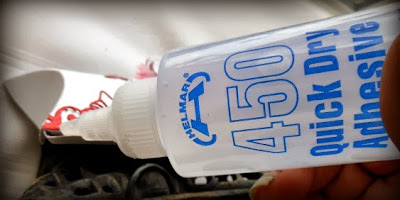 Helmar 450 Quick Dry Adhesive has a strong grip and really holds my elements in place. This is so important to me for a project like this mini album that will be opened and looked at often with photos and embellishments being bumped and jarred. I won't need to worry about the items in my album coming off. Below you will see a two-page spread of each set of pages followed by close-ups of the details. Here you can really see the texture I talked about earlier. The Helmar Crystal Kote Gloss spray put a nice protective sheen over the mixed media background and set up beautifully to keep the colors from smudging, yet allowed the gorgeous, grungy texture to show through. 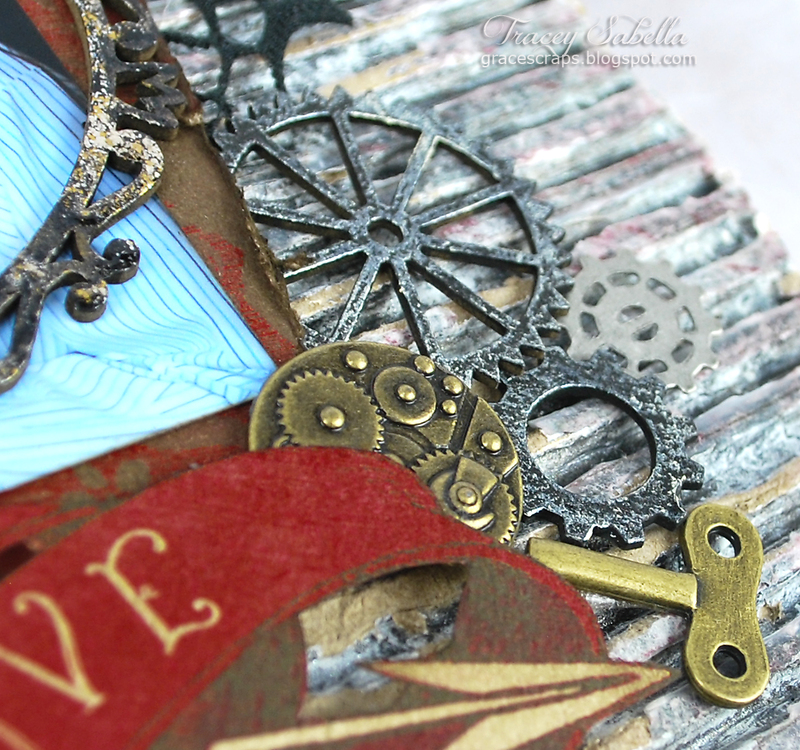 In areas like this with layered elements, I used Helmar Liquid Scrap Dots to raise up the fussy cut sentiment so that I could tuck the gears underneath. 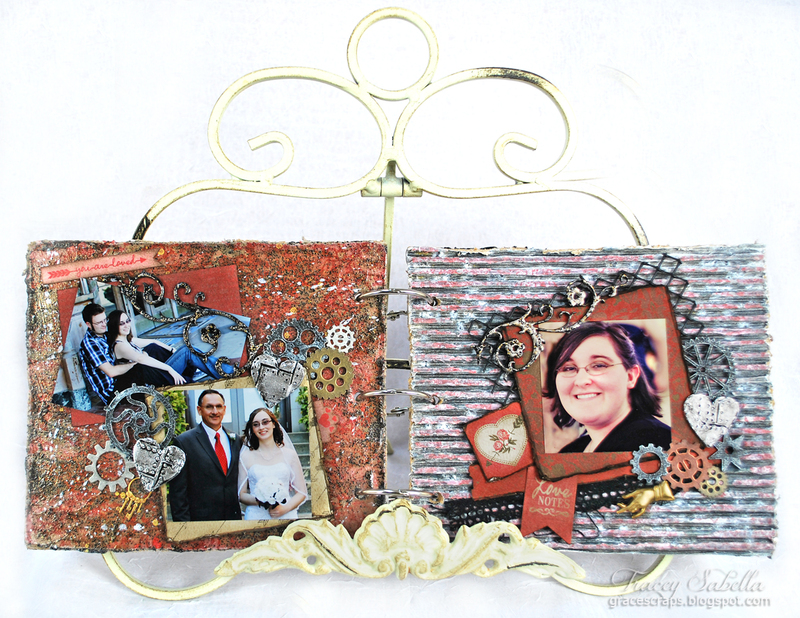 I attached the photos to their paper photo mats using Helmar Premium Craft Glue. Hi everyone, Sandee here, with a humorous love token for you. My first step ( after buying the plaque at a yard sale ) was to cover the piece with Helmar's Tacky Craft Glue evenly and that way your paper will lay completely flat. Then ink around the edges. 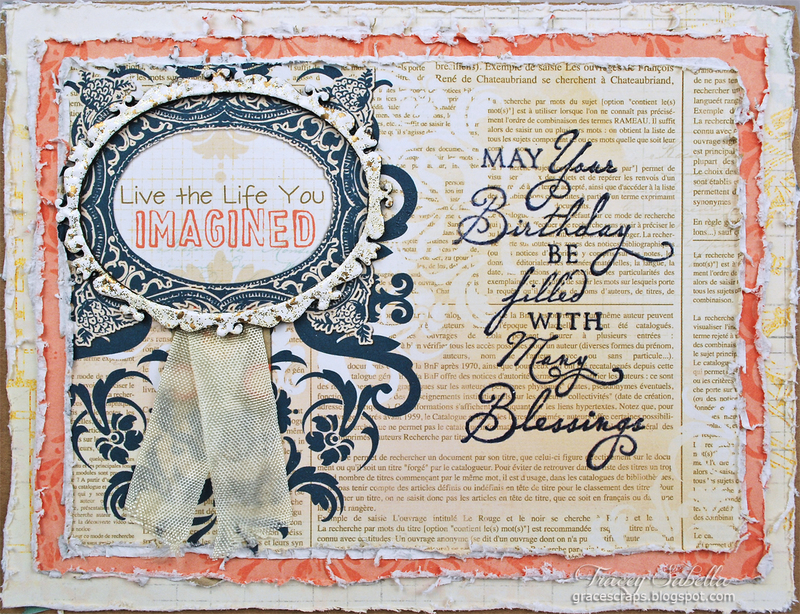 Then, add your embellishments! 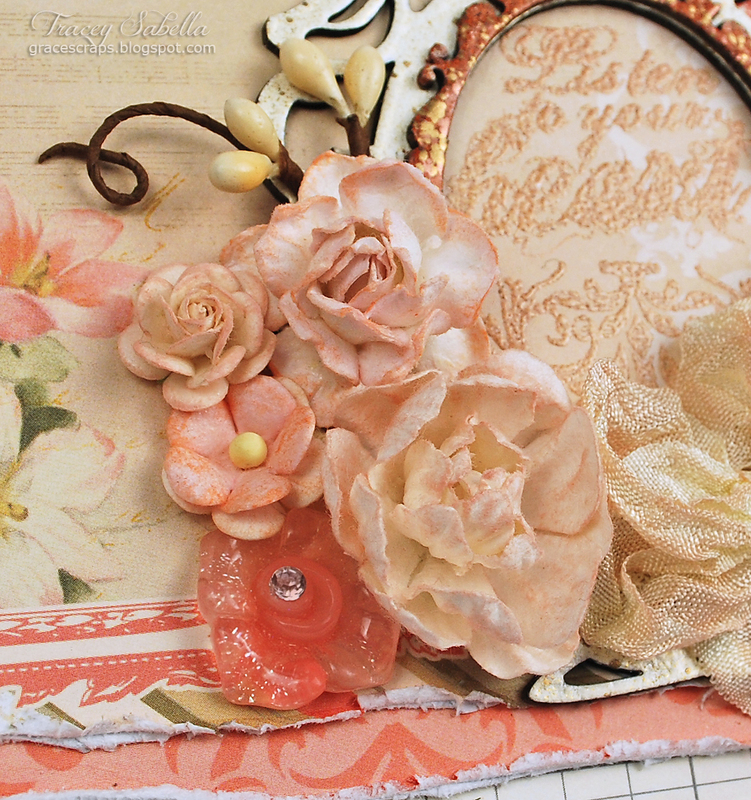 I used Helmar Craft Glue to adhere my die cut, Helmar 450 Quick Dry Adhesive to firmly affix my paper flower to the plaque and Helmar Gemstone Adhesive to glue on the pearls. I love using Helmar Liquid Scrap Dots for it's versatile lift and clear drying formula. 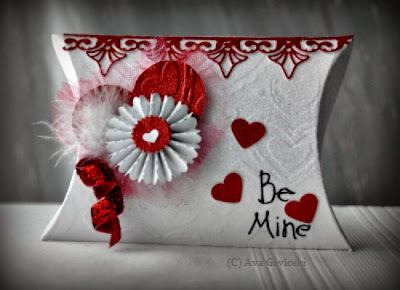 Hello, Ava here to share a great valentine gift box card combo. This year, design your Valentine card on a gift box. Google pillow box template sketches, print and cut from your favorite cardstock. Mine is Core'dinations Glitter Silk Cardstock for this pillow box. 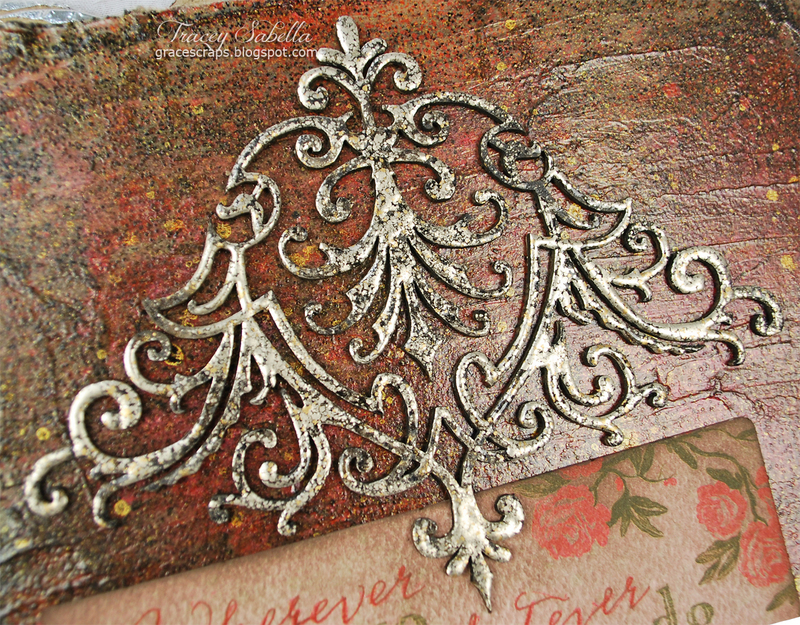 Emboss the glitter cardstock. Tip, when you have a project that is bigger than your embossing machine plates, try this option: lightly water spray the back side of your paper, and get out a heavy rolling pin and roll over your paper which has an embossing folder underneath. Experiment and you will be happy with this technique. 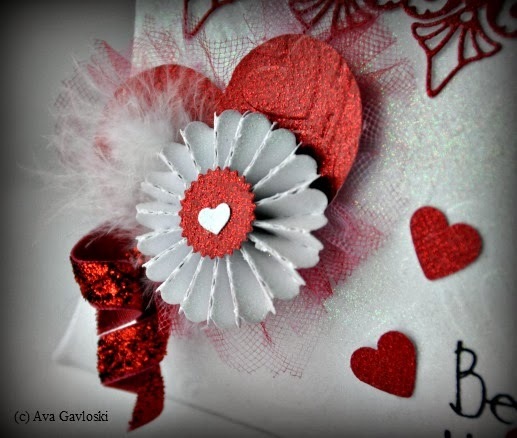 Die cut your border strip , mini paper rosette, mini hearts from Core'dinations Glitter silk and you are ready to assemble your pillow box using Helmar 450 Quick Dry Adhesive. This Helmar 450 Quick Dry adhesive truly is a great quick drying adhesive with a strong bonding adhesion. Once I had my mini rosette adhered with 450 Quick Dry Adhesive I added a dollop of Helmars Liquid Scrap Dots to the back side to adhere to the pillow box. Assemble your pillow box embellishment using Helmar 450 Quick Dy Adhesive to adhere the tulle, heart, feathers and ribbon. 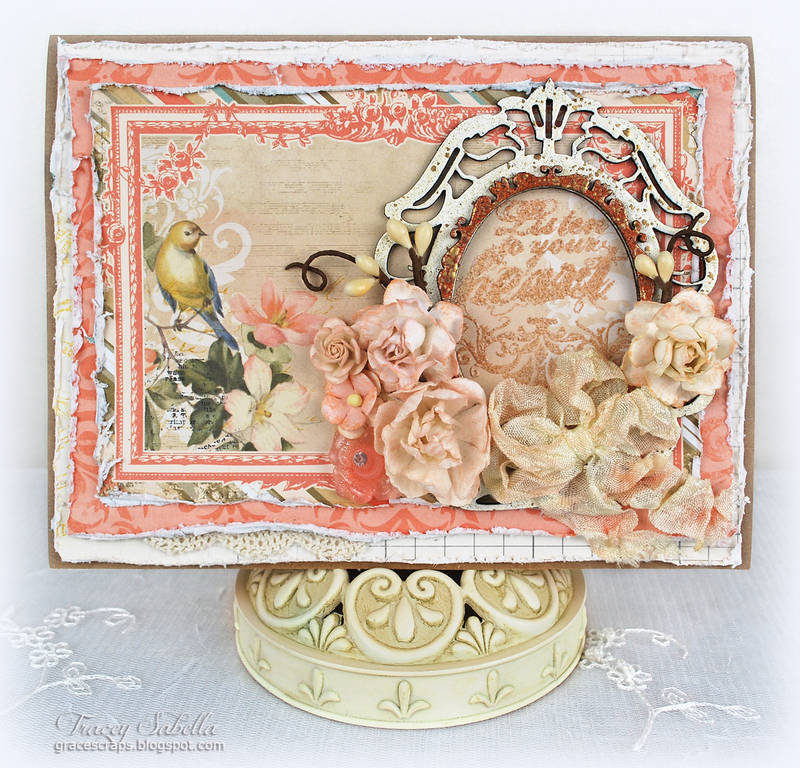 It's Tracey back to share a card I created featuring Helmar Premium Craft Glue. 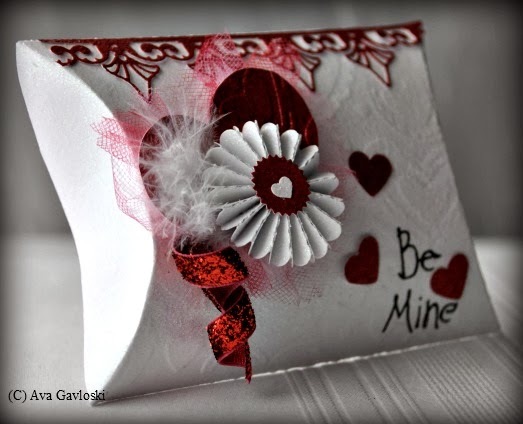 and I enjoy creating personalized cards to help celebrate these special days. My favorite adhesive for adhering paper to paper is Helmar Premium Craft Glue. I simply apply a bead of glue around the edge and swirl some in the center as shown. Turn the paper over and rub your fingers gently over the page to spread out the adhesive. When applying, you won't want to get too close to the edges to allow room for it to spread out. One of the advantages of using Helmar Premium Craft Glue is that you have a some time to adjust your paper and get it placed exactly where you want it. Because of the high solids content it will not warp your papers. 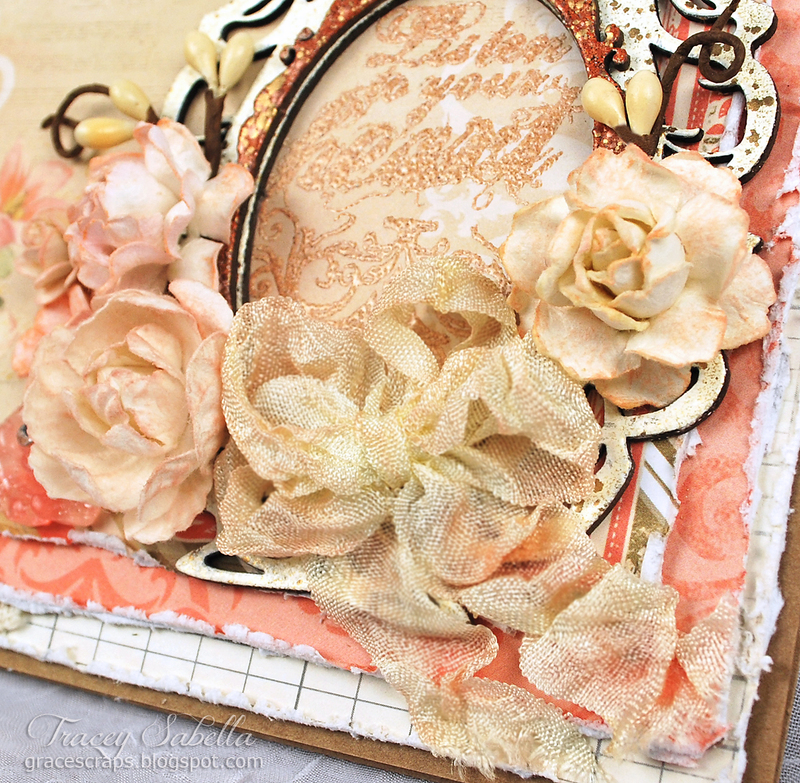 Helmar 450 Quick Dry Adhesive is perfect for adhering chipboard, flowers, and ribbon. I spritzed seam binding with water and scrunched to achieve this lovely texture, then when dry tied a double loop bow and brushed with Distress ink. Helmar Fabric Glue holds my bow in place as well as the scrunched ends. I adore how it holds even delicate ribbon in place without bleeding through. 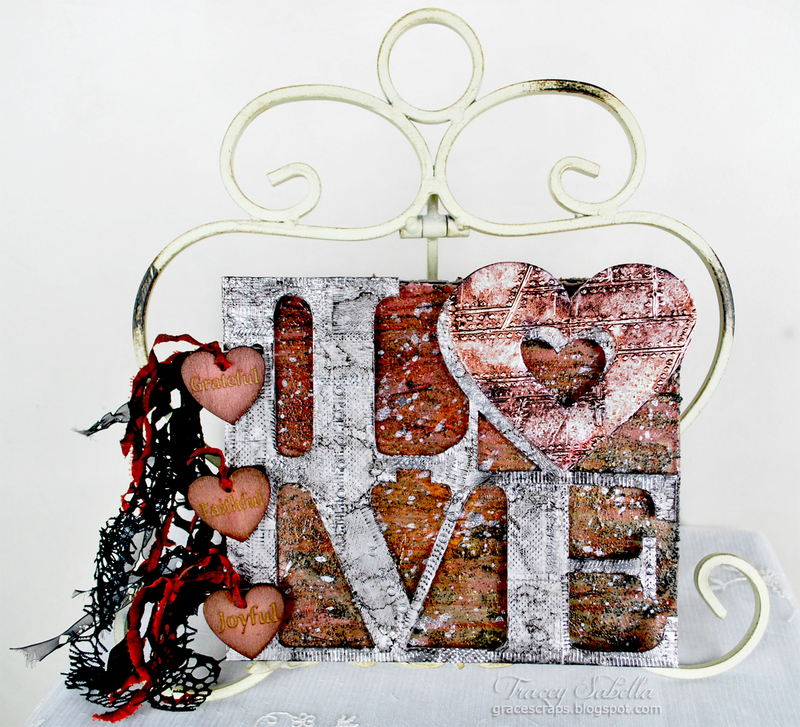 I heat embossed Fran-tage Embossing Enamel on Leaky Shed Studio Chipboard and used Donna Salazar Mix'd Media Inx and Embossing powder for my sentiment and flourish. It can be difficult to adhere mixed media elements together like these layered chipboard pieces, however, Helmar 450 is strong enough for this job. 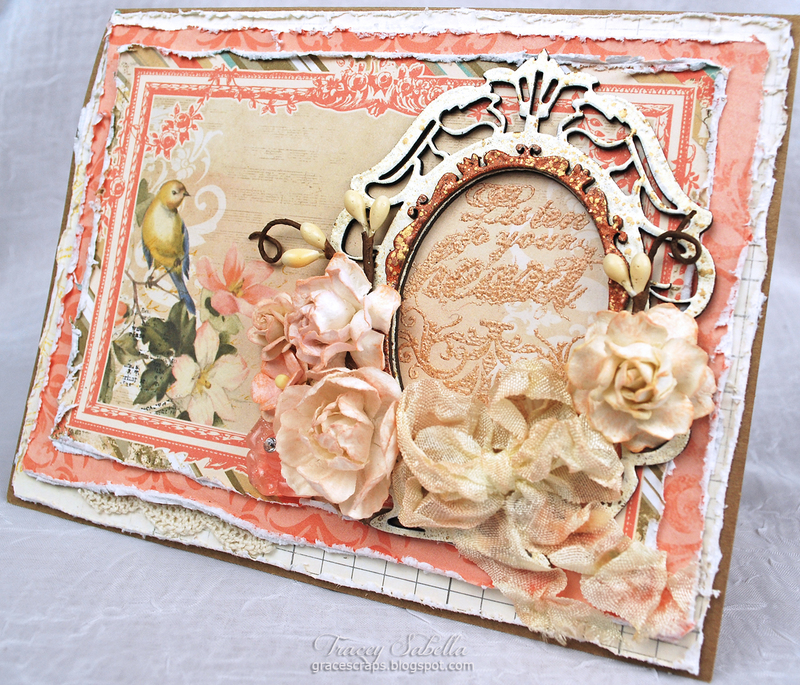 I stamped and embossed my sentiment before distressing the layers, then adhered my layers to the card base using Helmar Premium Craft Glue. Leaving you with one final shot. Here's a quick and fun way to make a lovely little box using recycled products that you may already have hanging around at home. All you need to start is a small cardboard box, an old sushi rolling mat, scrapbooking paper and Helmar's Super Tac Glue. You will also need any decorations you want to adorn the top of your box along with some ribbon/seam binding. 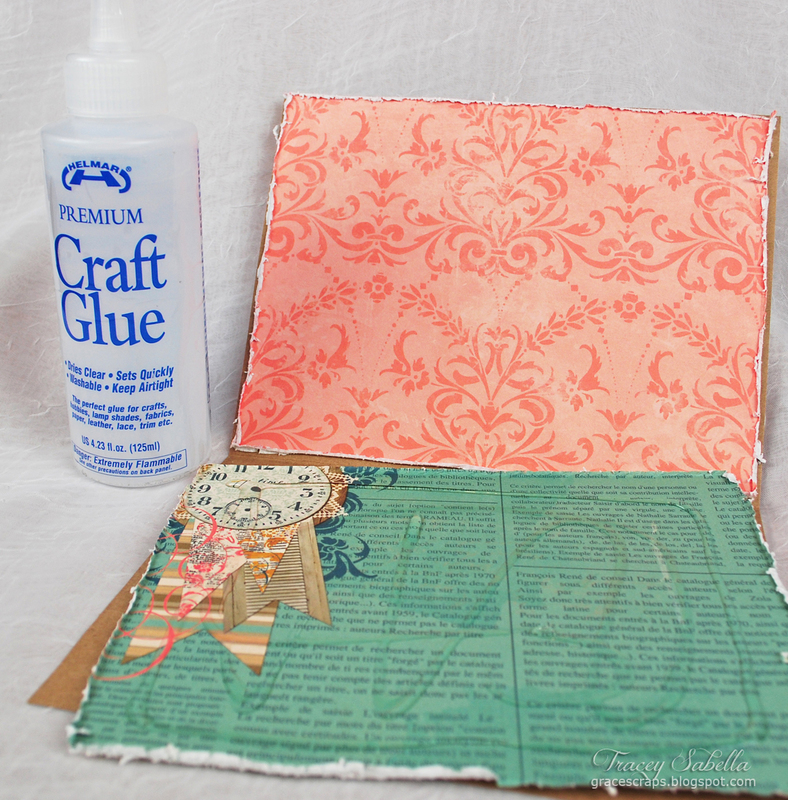 Firstly, cut two squares of your chosen scrapbooking paper to decorate the sides of the box and glue in to place. Once the sides have been covered it is time to cut the sushi wrapping mat to fit the width of your box, you may have to cut two strips so that it fits all the way around with a little hanging over the front. Use some simple clips to hold the matting while the glue dries, continue around the whole box. Secure the first edge and the last edge with Helmar Craft Glue for a strong hold. Allow a couple of inches of matting to hang loosly over the front. 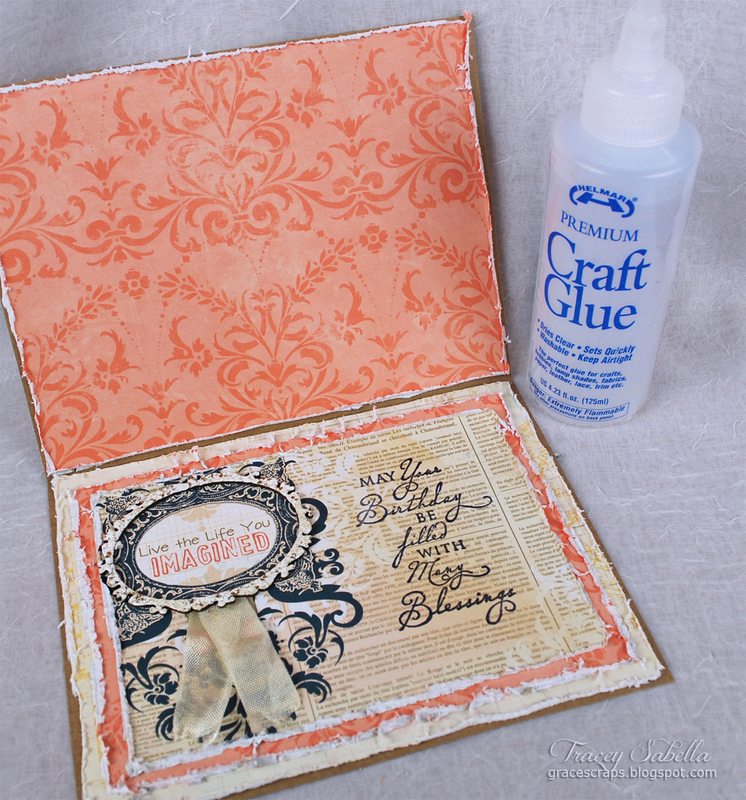 Add some trim of your choice to the edges of the paper using Helmar Craft Glue. Then you are ready to decorate the box any way you like being sure to add some ribbon or seam binding as a closure or even a magnetic closure if you have one. Once it's finished, fill with special gifts for someone special, your favourite laces or use as a special gift box. Thank you for stopping by today and I hope you like this easy project.